Bone cancer can affect any bone in the body. The tibia is the larger of the two long bones between the knee and ankle. A cancerous tumor is a body of tissue consisting of cells that have undergone genetic changes, causing them to grow in an uncontrolled way. A tibial tumor can be a primary bone tumor -- meaning it originated in the bone -- or a metastatic bone tumor that has spread from cancer elsewhere in the body. Common cancer sites that metastasize to bone include the prostate, thyroid, breast, lung and kidney. Pain is the most common symptom of bone cancer, although not all people experience this symptom. The pain is usually described as dull or achy. It may come and go initially, but become more persistent over time. The pain might occur or be more noticeable at night, and activity may worsen the discomfort. The pain can occur at the site of the tumor or in nearby joints. With a cancerous tumor of the tibia, pain typically occurs in the shin, knee or ankle. The presence of a lump along the shin may be a sign of a tibial tumor. The mass can be painful or painless, depending on the type of tumor and whether it is impinging on nearby structures. 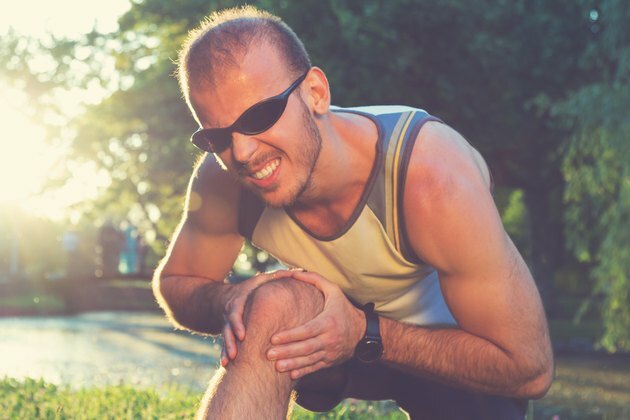 For example, a growing tibial tumor can cause nerve compression or bursitis -- painful inflammation of a fluid-filled sac found near body joints to provide cushioning and reduce friction. The growing mass can be firm or soft, and immobile or mobile, depending on the type of tumor. Swelling of the lower leg can also occur with a cancerous tibial tumor. Fractures can occur in a bone weakened by a tumor. These fractures, known as pathological fractures, typically occur with minimal or no trauma. As with traumatic bone fractures, a pathological tibia fracture is typically accompanied by sudden intense pain, deformity of the fracture site, and an inability to weight-bear and move the lower leg normally. Pathological tibia fractures can occur near the knee, mid-shin or at the ankle. As with any type of cancer, bone cancer of the tibia can cause generalized symptoms. Symptoms may include fevers, chills, night sweats, unexplained fatigue, changes in appetite and unintentional weight loss. These symptoms might indicate that the tibial tumor is metastatic and the primary tumor may be located elsewhere in the body. Seek medical care as soon as possible if you experience any signs or symptoms that might indicate a tumor of the tibia. While the possibility of cancer is scary, keep in mind that most bone tumors are not cancerous. Even if cancer is diagnosed, early detection and treatment give you the best chance for a cure. AAOS Comprehensive Orthopaedic Review; Jay R. Lieberman, M.D. Bone and Soft Tissue Tumors: A Multidisciplinary Review with Case Presentations; Therese J. Bocklage, M.D., et al.